Findlay Lawyers are committed Ticats fans. Rob Findlay’s love for the Ticats began during his childhood in the 1950’s and 1960’s, and has stayed strong throughout his adult life and professional career. 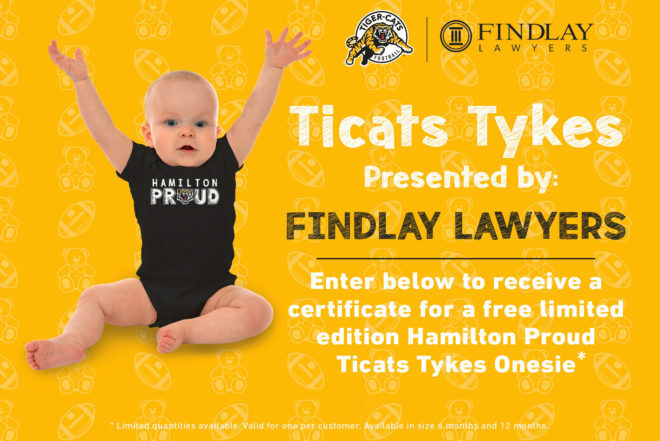 Findlay Lawyers now wants to help the next generation of Ticats fans support their hometown team by giving away a Findlay Ticats Onesie to the Ticats Tykes out there. Enter below for your certificate for a Hamilton Proud Ticats onesie so your tyke can show their Hamilton Pride. Use the hashtag #FINDLAYTICATSTYKES on social media for a chance to win Ticats tickets in the Findlay Family Zone and have your little tyke’s photo showcased on the videoboard on gameday! While quantities remain. Limit of one (1) per customer. Pickup only available at the Tiger-Cats Shop only, on non-gamedays. Must present certificate after filling out the form below.